Young women wait to cross Colfax at Irving Street last week, not far from where a driver killed Raymond Hansford Jan. 3. Photos: Andy Bosselman, Streetsblog, unless otherwise noted. Drivers have killed four people on Colfax Ave. already this year. City officials could move fast to fix the deadly street — and the killing will continue until they do, say pedestrian advocates. “It’s definitely been a bad year for Colfax,” says Jill Locantore, executive director of WalkDenver. 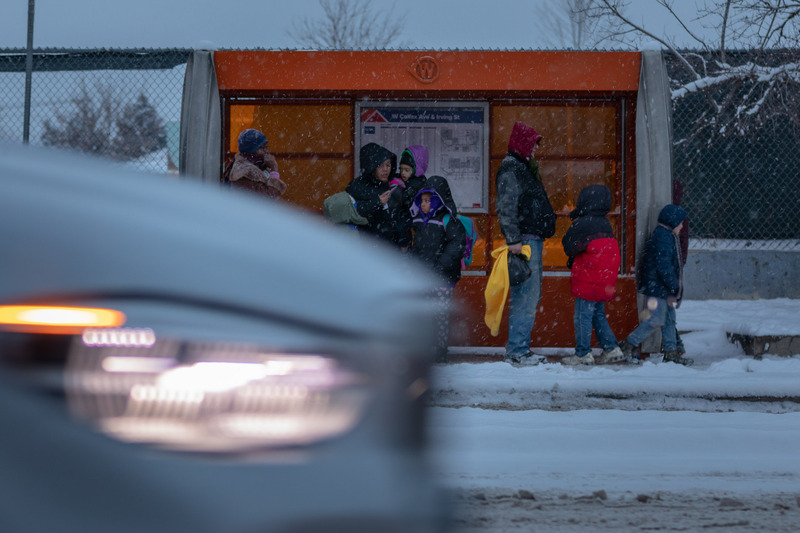 Parents with children wait at a bus stop near Colfax and Irving. Healing the street’s safety issues could be quick and inexpensive, she says. With some paint and some plastic posts, Denver could immediately improve safety at the street’s most dangerous intersections. If such traffic calming measures were in place, they may have helped 72-year-old Raymond Hansford, who died on Jan. 3 after a driver hit him on Colfax at Irving. The crash happened near the cloverleaf intersection where drivers from Federal Blvd. often travel at highway speeds as they merge onto Colfax, making the area especially dangerous. 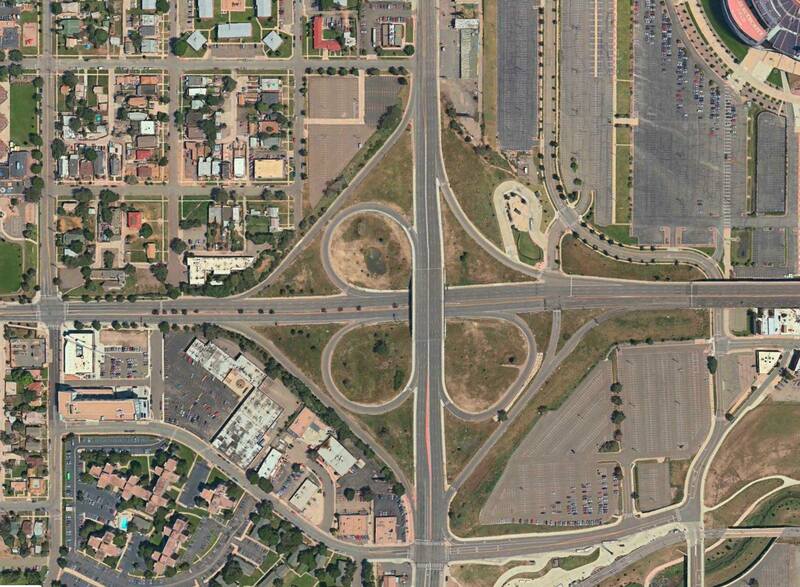 The cloverleaf intersection at Federal and Colfax encourages driving at unsafe speeds. Photo: Walk Denver. City officials know that Colfax is dangerous: It is a part of the “high-injury network,” the small number of streets where 50 percent of the city’s traffic fatalities happen. They also know how to transform an intersection quickly. In 2017, Denver installed paint and plastic posts on Colfax where it meets Park Ave. and Franklin, which was one of the city’s most dangerous intersections — and collisions declined there. After installing a painted curb extension at Colfax at Park Avenue and Franklin Street, crashes declined there. But Mayor Hancock, who committed in 2015 to end all traffic fatalities in Denver by 2030 as part of his Vision Zero pledge, has failed to repeat the quick and inexpensive safety measure at other dangerous intersections on Colfax and along other high-injury streets. And until he does, Denver can count on more deaths, says Locantore. Vision Zero challenges cities to eliminate all traffic fatalities through street design changes that help to control fast-moving traffic, better enforcement and more education. Many cities are seeing results from even the simplest treatments. New York, for example, pioneered the use of plastic posts with paint to narrow roads at pedestrian crossings. Since implementing those and other traffic calming measures, fatalities on its streets fell to the lowest level since 1910, when horses outnumbered cars. “Cities like New York City have demonstrated [that reducing fatalities is] totally possible if you just increase your budget for paint, which is a heck of a lot cheaper than concrete,” says Locantore. Despite Denver’s Vision Zero goal, last year the number of people killed on the city’s streets rose sharply to 58, up from 50 the year before. And with seven fatalities across Denver in the first six weeks of the year, the number of deaths would rise again this year, to 60, if the present rate of killing continues. Near where a driver hit and killed Raymond Hansford, footprints in the snow show where people cross Colfax near the Federal Blvd. cloverleaf intersection. A driver killed Raymond Hansford on a cold morning last month as he attempted to cross Colfax Avenue near Irving Street. RTD riders often cross seven lanes of traffic to reach this mid-block bus stop for the 15 and 16 lines. When Streetsblog visited the site last week, there were footprints in new snow, suggesting that others crossed the seven-lane street at the same place. A bus stop for RTD’s 15 and 16 lines is across the street. But its mid-block location requires a long walk. At the nearest crosswalk, pedestrians must push a “beg button” to trigger a walk signal. If they arrive at the intersection just after a green light, they have to wait for an entire light cycle for a walk signal. The light cycles at that intersection are incredibly long for people on foot, especially in blustery weather. Once someone crosses the intersection, they must backtrack to get to the mid-block bus stop. This process could take five minutes or more. 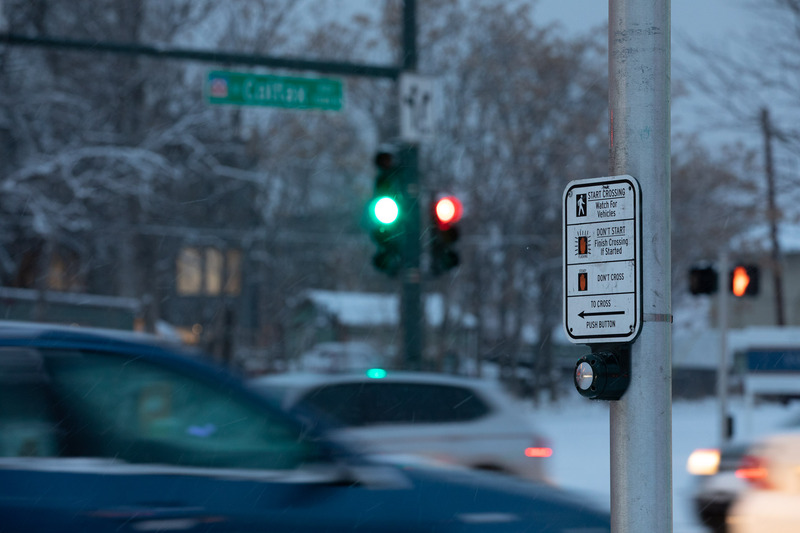 When people reach Colfax & Irving, they must hit a “beg button” to trigger a walk signal. 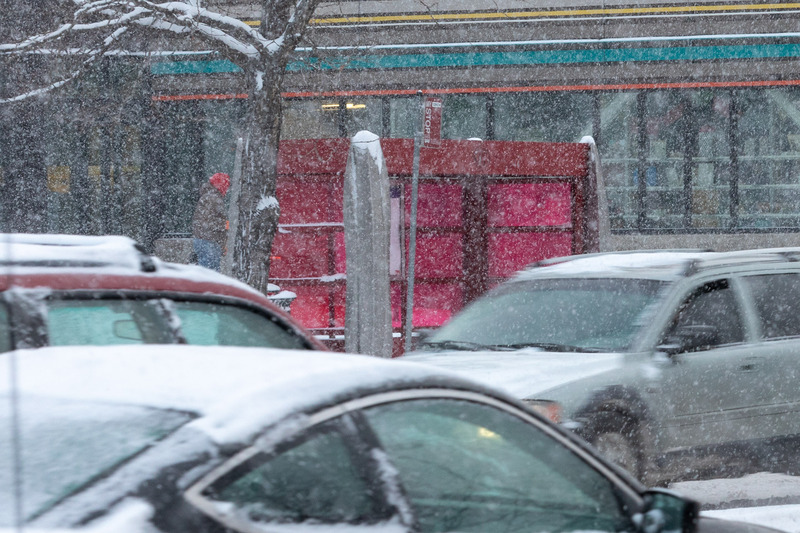 In the long-term, the city is planning to redesign the cloverleaf intersection, make sidewalk upgrades and install a Bus Rapid Transit line along Colfax, which will bring pedestrian safety improvements. 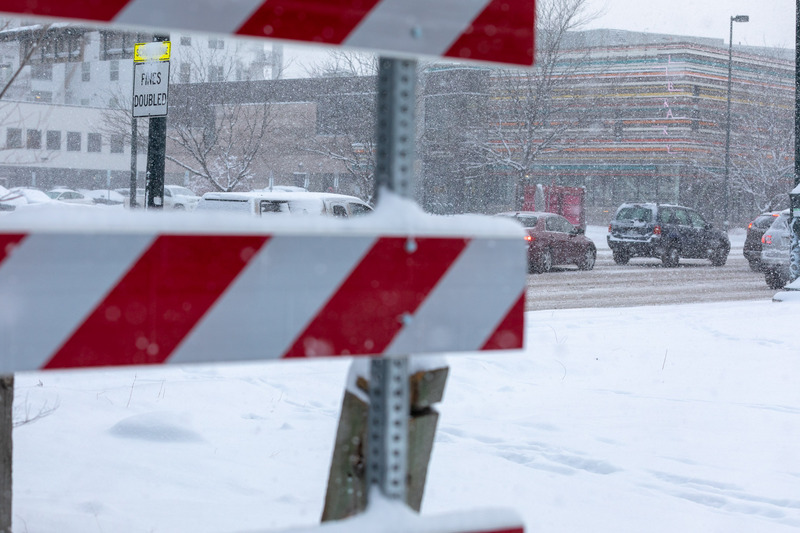 The police department has increased enfocrcement on Colfax, and other changes are being considered too, says Nancy Kuhn, a spokeswoman for the Department of Public Works. “Denver Public Works is in the process of reviewing these crashes and will be doing site visits at all three locations to see if we can make safety improvements,” she says. Of course, her department could make such changes tomorrow. All it would take is one call from the mayor. Note: The redesign of the cloverleaf intersection at Colfax and Federal will be discussed at 6 p.m. on Feb. 19 at the Alamo Drafthouse, 4255 W. Colfax Ave. between Stuart and Raleigh streets. The forum is hosted by the West Denver Business Improvement District and Walk Denver. Interesting piece yesterday on the growing fentanyl-opioid problem in the desert. Firefighters say opioids are not just showing up in overdose calls. They tell ABC15 that people are high during car crashes and are getting hit crossing the street while on heroin. Now it’s not just being drunk but being high on opioids that’s adding to the death count on roads. The paint and plastic posts at Colfax and Franklin are a big improvement, but they should be regarded as a quick, temporary measure until concrete curbs can be installed. The paint will wear off, the posts will get run over, plus they’re just kind of ugly. They’re great for a quick fix and for testing, but once it’s determined that the design is good, it needs to be made concrete. We should be doing a lot more of these quick fixes though. That’s the whole point of the paint and plastic, we can make changes quickly, make adjustments if needed, but start saving lives now.